At one point, I am assured by old family photos, I had lovely porcelain skin. That flawless epidermis was soon splashed with freckles, which were replaced with pimples in adolescence. I started suffering from acne when I was 11 or 12. To both combat and conceal the blemishes, my mom shuffled me straight to the Clinque counter, hoping that excellent skin care would fix the problem and that quality makeup could boost my sagging self-esteem in the meantime. But no dice. It was another nearly ten years of dermatology appointments, antibiotics, birth control, topical creams, infomercial products, homeopathic treatments and lots and lots of tears before the acne subsided. At the same time, I had weird patches of dry skin. Itchy, too. I remember in the afternoons I walked home from school, I would rub flakes from my forehead or nose with the ribbed fabric of my black hoodie. I’d pull the wrist of the hoodie over my hand and rub like crazy. I felt like I could rub my skin forever and never see an end to the flakes. They were tinted beige, thanks to the gobs of foundation I used. When the acne started to fade away (never completely, but good enough), I had a few moment of actually feeling like I had pretty skin. Ah, bliss. Those were those days. Once, my husband and I were about to head out on a trip to New York City. It was a dream vacation for me, until I woke up with red, dry, itchy, flaky, splotchy skin! Even after exfoliating gently, applying cold compresses and carefully applying makeup, my skin still sucked. I was crying, wishing I could just cancel the whole trip. With minutes to spare, I raced to a local health food store and bought a product that claimed to treat Rosacea. I washed my face again and reapplied my makeup on the way to the airport. The product buuuurned my skin, but improved the appearance slightly. As soon as we returned, I booked an appointment with a dermatologist. She looked at me for about twenty seconds, cocked her head and proclaimed, “Seborrheic dermatitis . . . Maybe a touch of Rosacea.” She wrote a script and was out the door in under a minute. Once I started using the sulphur wash and Elidel, my skin improved dramatically. But when I got pregnant, my doc told me to stop using the Elidel for the Reston my pregnancy and while nursing. Since I planned to breastfeed for a year or longer, I felt a sense of panic at what would happen to my skin! I think topical prescription creams can really save the day when your skin is at its worst, but I realized that I wanted to find a lifestyle treatment so I wouldn’t have to depend on these prescriptions, even if the risks are low. Since then, I have been trying to figure out the right skin care for my skin and scalp. I have been frantically reading everything online and trying different options. 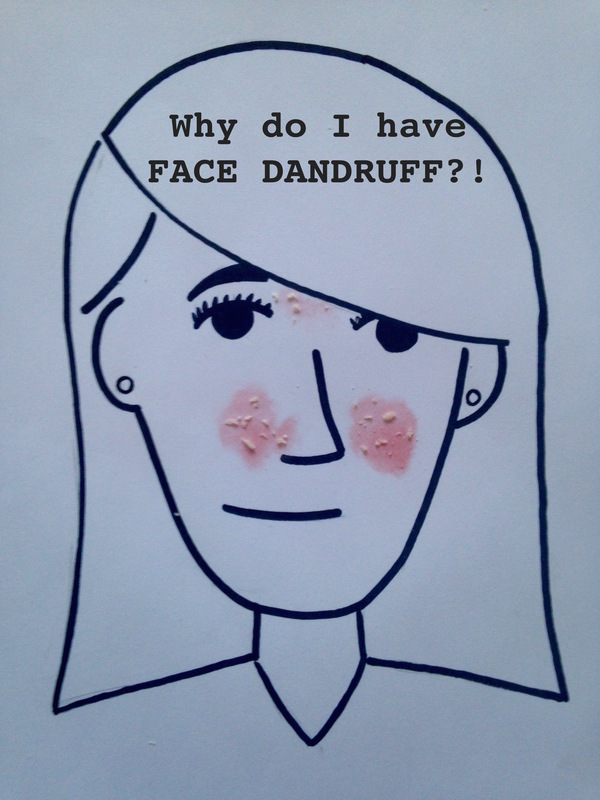 No, it’s not the end of the world to have a little dandruff or red, flaky skin. But it can be physically painful, or at the very least aggravating. And we all want to look our best. I am still searching for the magical cure for sebhorreic dermatitis. There is actually a huge void of information online, in my opinion. I’m going to gather and post as much as I can on this website. Kiss your flakes goodbye! Elidel is actually not a steroid, it is an immunomodulator. With steroids, thinning of the skin is an issue, but immunomodulators don’t have that as a side effect. Creams like Elidel (= Pimecrolimus) and Protopic (= Tacrolimus) work very well in the treatment of eczema, and many people have used these products with success for years, but they do seem to have a dark side: increased cancer risk. These drugs aren’t directly carcinogenic, but they subdue the immune system locally (and in rare cases systemically if enough of the product is absorbed through the skin), which could give pre-cancerous cells the opportunity to become cancer. Normally, this isn’t issue, since our immune system gets rid of these pre-cancerous cells. That said, the risk is probably extremely small. Thousands of people have used these creams and the cancer link is dubious. A few people developed cancer not long after using these drugs, but perhaps these people would have gotten cancer anyway; the evidence that they got it from these products is shaky. And some dermatologists have pointed out that eczema sufferers have a small increased risk of getting cancer anyway, due to the near permanent skin inflammation. Moreover, the psychological stress of having to deal with a skin condition isn’t healthy either. So it’s a trade-off and everyone should decide for themselves if the trade-off is worth it. If your eczema isn’t that bad, I’d try other things first, but if it is, these immunomodulators are great. Obviously, as always, consult with the GP and/or dermatologist for best treatment advice! Thanks for the info on Elidel! I’d like to do more research and write a post about it. For me, it helps to a certain degree, but the fact that my doctor wasn’t keen on me using it while pregnant or breastfeeding concerned me. Plus, it is always ideal to find a lifestyle that treats a problem, rather than a Rx that has to be used in perpetuity. But I agree, the emotional impact of feeling unattractive (not to mention the ITCHIES and even PAIN) means that Elidel can be great choice for managing symptoms. Definitely agree on talking to your doc! Thanks for the comment – you seem super knowledgable on the topic! I have SD in my ears and on 2 areas of my scalp. It complety cleared during both of my pregnancies but returned after both. Using a sulfate free shampoo works better than any medicated shampoo for me. My scalp goes crazy if I pull my hair up while wet. Makes me think its fungal. So interesting that your your seborrheic dermatitis clears up when pregnant! For some, it flares up. Glad to have someone else confirm that putting their hair up when wet causes it to worsen . . . I wondered if it was just my imagination. It’s definitely not your imagination! All my life I had long hair that went past my shoulders. I got a pixie cut 3 years ago, but it wasn’t until I recently started growing my hair out again that I noticed just how much of a difference having long, wet hair makes when it comes to the discomfort (increased itching) of my scalp. It doesn’t clear up completely even when I’m sporting short hair, but it makes a BIG difference! If you’re game for a new look and spending less money on shampoo, I recommend going short! Seriously, you just sealed the deal for me! Next payday and I’m off to the salon. I’ve been debating for awhile, wanting to go short not just because of my troublesome scalp. My dr prescribed Elidel, but my insurance company won’t pay for it, and there is no genetic version right now. Not sure what else to try – it’s very frustrating. I was so excited to hear there is a treatment, but the same day found out I couldn’t get it. Sorry I didn’t reply sooner! Have you found a solution for your seborrheic dermatitis?